How do you like them pickles?! Mmmmmm… how do I love them pickles! Not on ice cream, but I could sit down and eat a whole jar in one sitting. I haven’t tried it, but I am sure I could do it! Someone challenge me! “Whoa! Calm down! I challenge you to eat a jar of pickles in one sitting.” I was going to anyways. Maybe some other time. I am trying to tell people what this post is all about. Hahahahaha… I love it! Have you ever seen a cuter pickle? “Yes.” LIAR! I am thinking, most likely not. 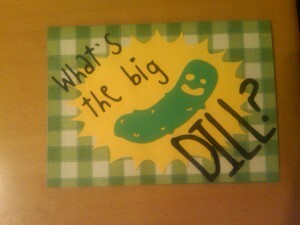 For those of you who can’t read, the card says “What’s the big dill?” I hope my readers were smart enough to get that joke. And the inside says, “It’s only your birthday.” Well, I thought I was clever. All you need is some fun paper, glue, and a Cricut. I suppose you can cut out the pickle by hand, but it won’t be as crisp. I don’t know about you, but I prefer my pickles crisp. Unfortunately, I had trouble finding a pickle .svg online so I had my wonderful husband make one for me. Ya, I got him in check! I love you, Husband! I wish I could share the file with you, but I have no idea where it went 🙁 Maybe I can talk him into making another one? Hmmm… what can I do to convince him? Well, this was just a fun idea I wanted to share with you all. Hope you enjoyed it. If you didn’t, well, just DILL with it! 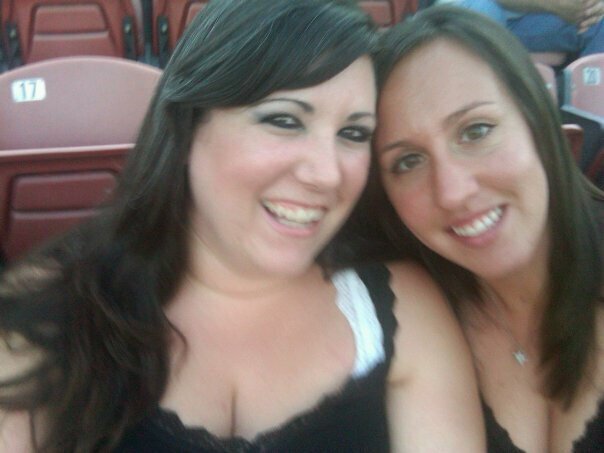 My bestie and I. Love you, Stef-a-lef-a-gus! This next creation was one of my first with my Cricut. Actually, it was one of my first paper crafts altogether! I made this for my sister-in-law, Corinne. She was living in New York and working as a jewelry designer for Tiffany’s. I made this for her when we found out she accepted a job with Swarovski in Paris, France! 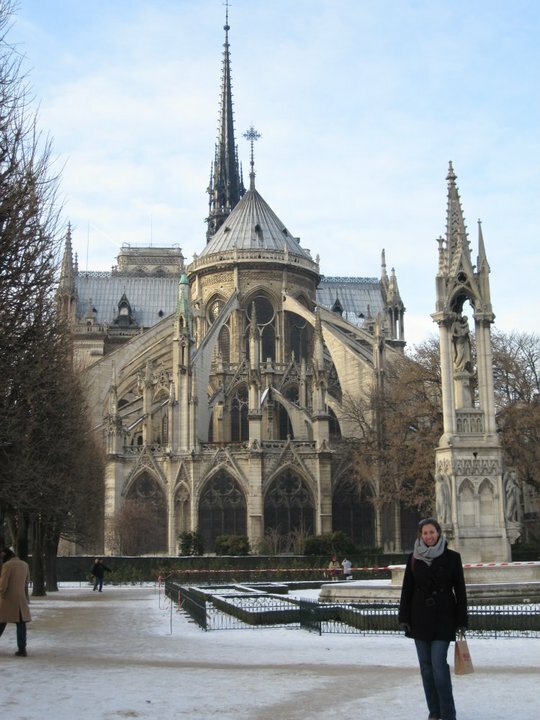 We all were sad to see her go so far away, but so excited that she got such an amazing opportunity! 1) This is a 5×7 card, blank on the inside. I used a green floral pattern for the background. Easy so far, right? 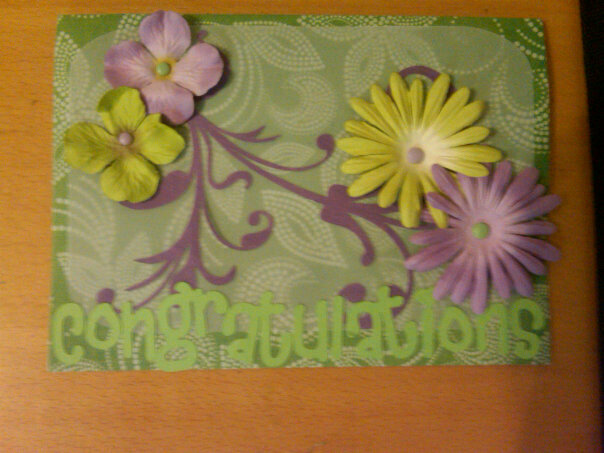 2) I used my Circut to cut a purple floral pattern and a green “congratulations.” Still with me? 3) After gluing the purple floral cut out onto the background I placed a cut out piece of transparent paper on top to soften the background. Then I topped it off with fabric flowers and brad centers. Violà! You have a card to give to that someone special! 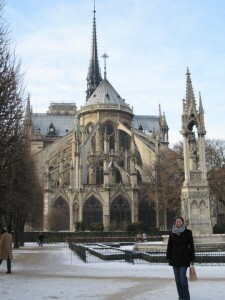 Corinne at the Notre Dame in Paris! 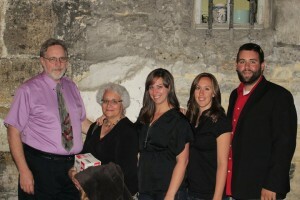 Our family trip to see Corinne in April 2011. You are currently browsing the archives for the Personal Cards category.